1872 The company is founded by Tokuzo Saito on 1-chome of Oomichi, Tokushima-shi as a domestic and foreign sugar wholesale business. 1890 Tokutaro Saito (second generation) succeeds the business. 1925 Eiji Saito (third generation) succeeds as representative. 1948 The corporate body Saito Industry Inc. is established. 1950 Corporate name is changed to Saito Shoten Inc.
1952 Sugar wholesale business is resumed after the lifting of regulations on sugar. 1966 Masami Saito (fourth generation) succeeds as president and representative director. 1971 Corporate name is changed to Saitoku Inc.
Yoshihito Saito (fifth generation) succeeds as president and representative director. 1983 Head office is moved to Tokushima Sogo Ryutsu Center. 1998 Kenji Saito (sixth generation) succeeds as president and representative director. 2006 Shoji Saito (seventh generation) succeeds as president and representative director. 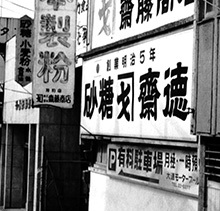 Saitoku Inc. was founded in 1872 as a business that mainly sold sugar and wheat flour. We have had the honor of doing business with many of our customers in the food industry. As history progressed through the Meiji, Taisho, and Showa periods, the eating habits of people changed greatly with the times. At the time of the company’s founding, sugar was considered a highly valuable commodity. Demand exceeded supply, and sugar itself had great competitive power. Our company has run an honest business by upholding the principle of never deceiving our customers, even during the turmoil and confusion of the First Sino-Japanese War, the First World War, and the Second World War. This has allowed us to develop strong relationships based on trust with many customers. We have also been better known as a family trade rather than a company. We have always placed priority on developing and maintaining long-lasting relationship based on trust with our customers, suppliers, and business partners, over corporate expansion. 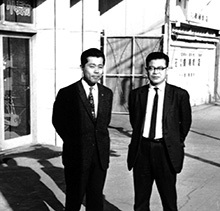 Yoshihito Saito, who is the current chairman, assumed the role of president and representative director in 1971. The corporate name was changed to its current name, Saitoku Inc., and we began taking the transformative steps from being a family trade to becoming a company. The current chairman explained the ideal relationships to maintain with suppliers and customers, often claiming that “the supplier is our mother, and the customer is our father.” He also liked to explain in depth the Japanese proverb, “Heaven’s net has large meshes, but nothing escapes,” while he was talking about his life or morality as a member of society and businessperson. It was during this time that the foundational Saitoku principles and the business creeds were developed. During the oil shock in the 1970s, we faced a period of chaos and confusion and sugar was also in short supply. However, even during such difficult times, we did not waver in our dedication to never inconvenience our customers by restricting sales or deceiving the society we serve in any way. To this day, the fact that we continued to deliver our products through safe and stable practices during those times is our company’s source of pride. 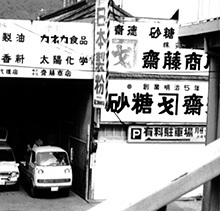 In 1983, we moved the company from its place of founding to its current location at the Tokushima Sogo Ryutsu Center in Kawauchi-cho, Tokushima-shi. This is when we firmly established our identity as a company. To keep up with the diversifying dietary culture of Japan, the food industry transformed and expanded at a dizzying pace. In order to meet the new demands of customers, we began dealing in products other than the main conventional products, such as sugar and wheat flour, and expanded the line of business to include confectionary and pastry products, as well as refrigerated and frozen foods. By diversifying our line of business, we’ve gained the opportunity to serve customers in various industries. This has given us the chance to accumulate a wide array of information regarding food, including traditional Japanese confectionary, western confectionary, pastry, the food service industry, and the food industry as a whole. In 1998, Kenji Saito became president and representative director. He made efforts to further expand the confectionary and pastry business. Then in 2006, Shoji Saito became the current president and representative director, and established the corporate mission statement. “We at Saitoku consider it our mission to value our customers’ interests and always putting their needs first, with the conviction that it will bring happiness to our employees, and thereby serving regional communities. ” We strive to build a work environment where employees are always considering our customers’ interests and valuing each and every “thank you” we receive. We want these words of appreciation to resonate all around, and make it a workplace in which our employees can feel proud. Unprecedented waves of change have been sweeping over the food industry as the Japanese economy transitions from a period of growth to a period of maturity. There are countless changes that the industry is facing, such as the growing effects and influence of mergers between suppliers and manufacturers and the integration of food distribution systems implemented by major trading companies. We are determined to directly face the challenges brought upon by these changes, with the support of our firm foundation of the relationships based on trust that our predecessors worked so hard to build. We must pave our own, unique path to the future, while also adapting resourcefully to the rapidly changing environment that surrounds us. By fully capitalizing on our foundation as a sugar and wheat flour wholesale business, and refining it with the knowledge we accumulated over the years in the business of confectionary, pastry, and raw food materials, we aim to build an innovative enterprise that changes the conventional image of the food product wholesale business. We are in constant pursuit of improving our business by building our operations on the pillars of food safety, health, and our consideration for the environment and the regional communities. We believe that our contribution to the society leads to the happiness of our employees.